Tonnages: 16,842 gross 9,931net 26,814 deadweight. 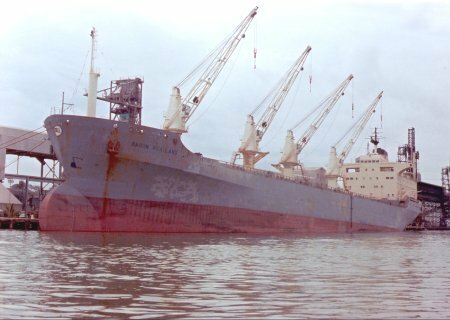 June 1976: Completed by Govan Shipbuilders Ltd., Glasgow (Yard No. 218) for H Hogarth & Sons Ltd.,Glasgow. Scottish Ship Management Ltd., Glasgow, managers. 1983: Sold, Apiomar S.A. Greek flag, renamed EVANGELOS L.
1991:Sold, Government of the Peoples Republic of China. (Bureau of Maritime transport Administration - Shanghai Branch) Chinese flag, renamed HUA ZHEN. 1999: Owners became China Shipping (Group) Co. Name and flag retained. 2012: No longer updated by (LRF) IHSF since 14 June. Existence in doubt. The Baron Pentland had larger accommodation than the other Govan built ships as she was built for Australian service and they had larger crews. This can be quite clearly seen from this photograph which was taken by I. Warner whilst alongside at Gladstone, Qld. If anyone is wondering where the port lifeboat is, the photographer is standing in it!